They say, when you have writer’s block, you should write about something you know. Well, I can honestly say, after 27 years of practice, I think I know how to grow tomatoes. 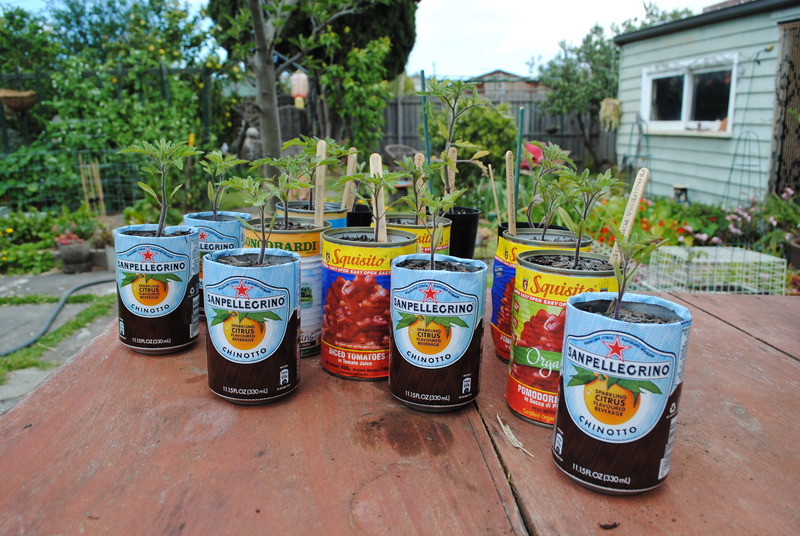 So, as promised, a bit later than predicted, here’s my guide to growing tomatoes. Many of these tips can still be brought into play for those in southern Australia; for those in the far north, or the northern hemisphere, you can start planning and dreaming, and file this post away for a few months down the track. As discussed in A Pocket Full of Seeds, this year I propagated the majority of my tomato seedlings from seeds collected from summer 2013. I’ve planted 10 tomatoes so far, but intend to relocate one self-seeded plant, which popped up in an inconvenient spot, and which looks too healthy to pull out. So that will be No.11. I only grow heritage tomatoes these days, and by and large the Principessa Borghese, which is one of the most prolific varieties I have ever come across. Originally bred by the Borgheses for sun-dried tomatoes (and it serves this purpose to a T), the fruit is all-purpose, and picking always involves the equivalent in eating. Last summer I probably annoyed a whole lot of people by posting pictures like this on Facebook, regularly. We worked out that a bowl was roughly equivalent to 4kgs, and we picked about 20 bowls’ worth from January to April. 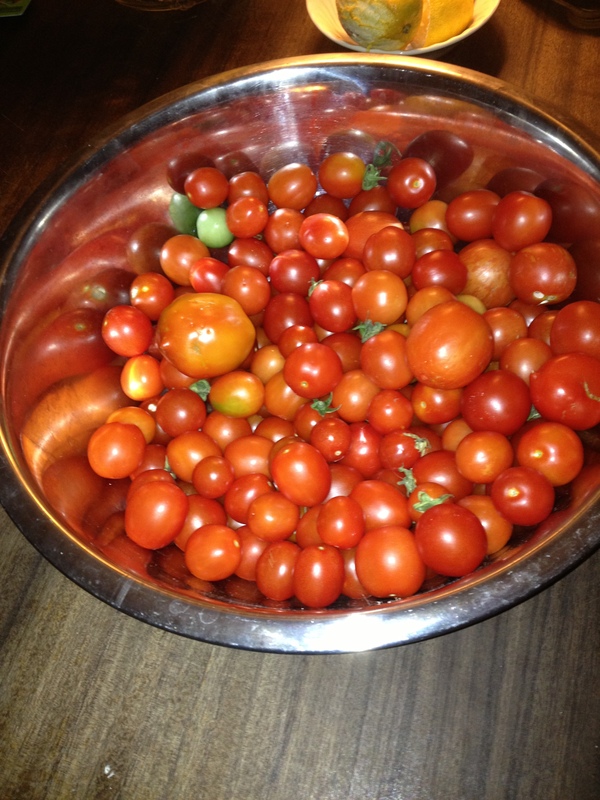 In the end, counting the masses of tomatoes we gave away, sun-dried or turned into sauce, I reckon I grew about 80kgs. No kidding. In A Man, A Plan, A Canal, Panama I mentioned that I had let the bed where the majority of tomatoes had grown so well last summer lie fallow all winter, adding cow manure and compost over the past six months. Now, ‘though, I’d not waste a bed in the winter months in such a way, as I’ve learnt that there are crops that can assist in tomato growth and in controlling bad soil bacteria, such as mustard greens (thanks to The Diggers Club catalogue for that info). So I don’t waffle on in perpetuity about growing tomatoes (which I could do, easily), I’m going to list a few key things that I’ve discovered over the years. Add any of these to your tomato plan, and I guarantee better more bountiful crops, whether in pots or in the ground. The wire baskets – well, there’s a long, beautiful story behind these, involving a trip to a mate’s farm and a rapid conversion to cow manure, but there’s no space to recount it here. All I can say is, these have been in the planning for two years, and finally implemented. Called ‘Tomato Wire’ at your local hardware (ha ha), making circular baskets for your tomatoes precludes the need to stake and tie, and re-stake, and re-stake and re-tie … you get the picture. 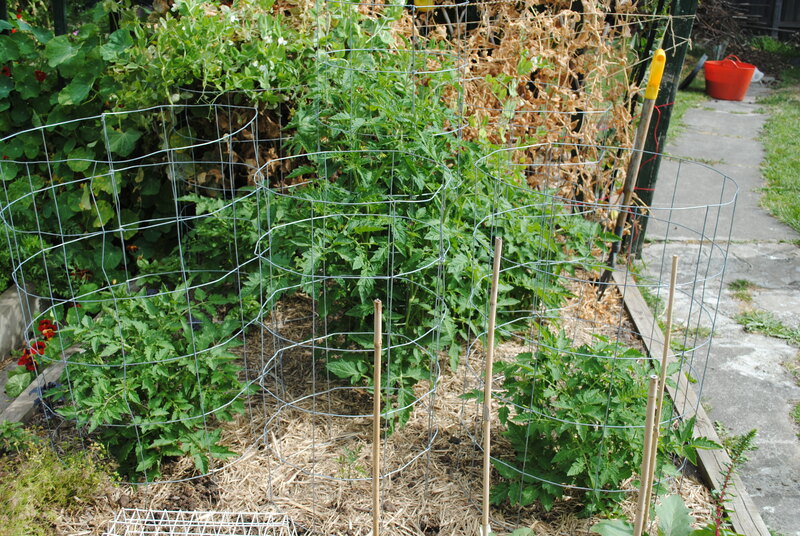 They allow your tomatoes to ‘grow naturally’, supported by the wire frames. They also allow easy access to the fruit and therefore help to maximise your crop. Nitrogen Soup – I can’t remember where I got this idea from, possibly from Dirty Deeds on 3RRR, or possibly from Don Burke. Wherever I got it from, it is dynamite. 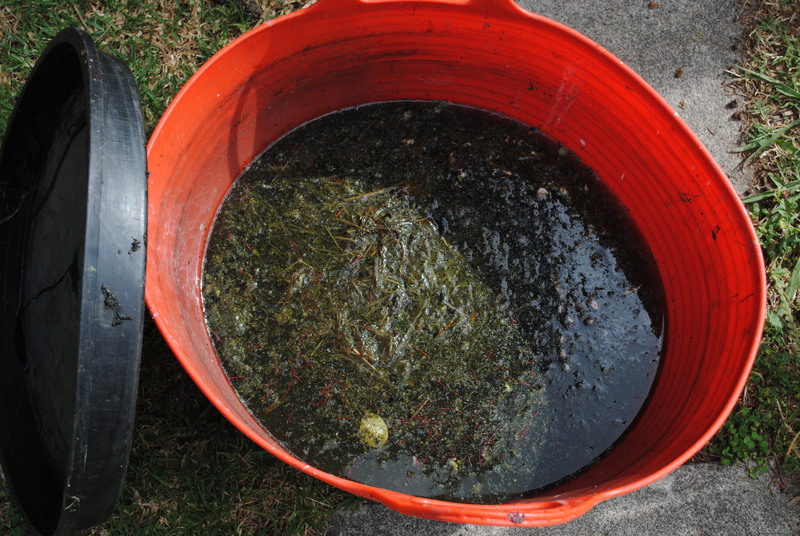 When you weed, collect up all the dandelions, thistles, non-invasive grasses, clover, etc (I never include mallow or anything oxalis-related), put them in a large bucket or container and cover them with water and a lid. Let it sit for about three months in a cool, isolated spot. It will stink when it’s done (the longer the better), but, diluted in water (10 parts to 100, approx. ), Nitrogen Soup is the BEST liquid fertiliser for nitrogen-loving plants you will ever, ever find. And it’s homemade, and free. Liquid fertilise your tomatoes every week from the point of planting to fruiting; after that, you can trickle off – they’ll do the rest on their own. Picking bits off your plants – this is a controversial subject that has gone through many revisions over time. I no longer pick out the middle shoots but I do pick off early flowers (i.e. you know what size the plant can get to, so let it get to that size before fruiting). This has been a very successful practice in my experience, and I am persevering with it (I’ve stopped with the Violet Jasper [feature image], which has multiplied about 50 times in size since I planted it six weeks ago and is an early fruiter). Water – This is the absolute essential element in good tomatoes. Water is why I plant on, or as close to as possible, Grand Final Day in Victoria (the last weekend in September), as the climate has become warmer and if you plant around this time, you can take advantage of the spring rain (for the last three years, anyway). Tomatoes need to be watered regularly and evenly. During the dry periods, water every three days and give them a good soak, letting the water penetrate the roots (don’t water the foliage, as this can cause various fungi and leaf diseases). Mulch, mulch mulch – what can I say? You need to mulch tomatoes, lots. Companion plants – Everyone knows that basil grows well with tomatoes, and this is true. But, a thing to note, is that basil likes a bit of shade, so planting it where it will eventually get shaded by the tomatoes from the harsh western sun is a good plan. Similarly, lettuce, coriander, beetroot, spring onions, or anything else that likes sun, but not too much, is a good companion. The only thing I’ve read about that are not a good companion to tomatoes are brassicas and leeks. 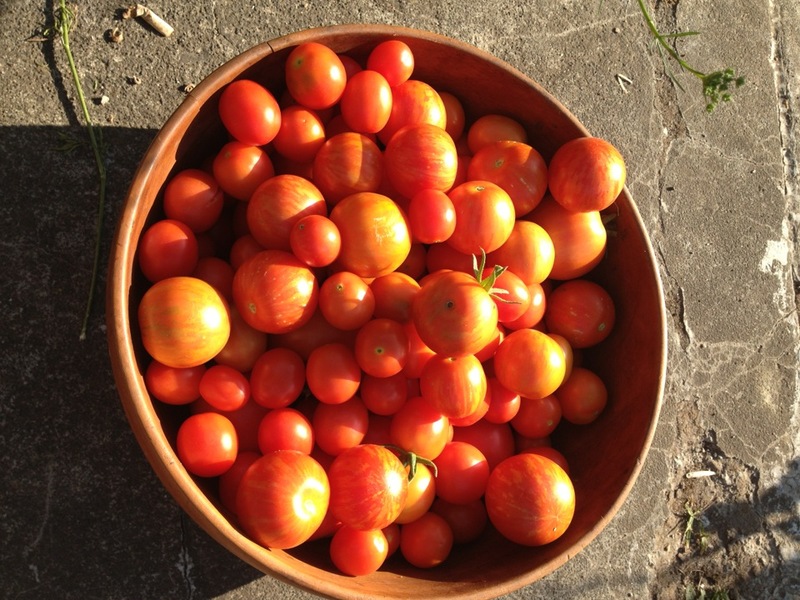 There you go, another bowl of tomatoes from summer 2013. I’d already sun-dried jars of them, made zucchini & tomato chutney, given bags and bags away, and there was no where else to go – I had to make tomato sauce. And we ended up making about five batches of the stuff, which, having given away a few bottles, will last us up until it’s time to make it again. The recipe belongs to Sally Wise, and is the tastiest and easiest tomato sauce recipe I have come across. *As long as the volume of vinegar is a third of the weight of your fruit, you’ll have adequate preservation to last for years. **Sally recommends tying these whole spices up in a muslin bag, then removing the bag once the sauce is cooked. This is what I do, but another alternative is to grind the spices before adding them to the sauce, which will make it darker in colour. Combine all ingredients in a saucepan and bring to the boil. Simmer, stirring regularly, for four hours. Strain mixture through a sieve or food mill into a clean saucepan (we never bother with this step, as the peel is so insignificant and the process is so tedious). Bring to the boil over a medium heat and simmer for five minutes. Pour into warm, sterilised bottles (sterilise bottles in an oven on 150 degrees Celsius for five minutes), then seal. 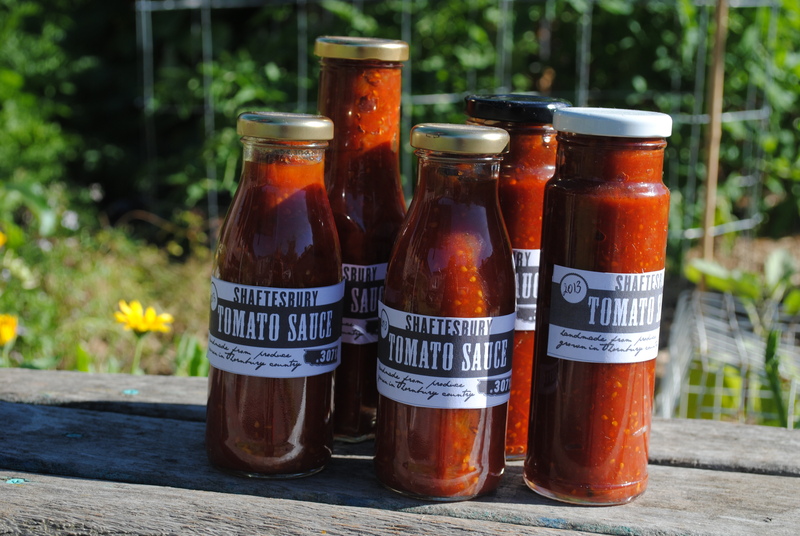 The last remaining bottles of sauce from the ‘Summer of Tomatoes 2013’. Please, if you have anything to add to this non-exhaustive list of tips on growing tomatoes, or what to do with them when you’ve got them, get in touch. Early in 2014 I’ll post something on sun-drying tomatoes, the traditional Italian way.